Uganda joins the rest of the world to commemorate the World AIDS Day on 1st December 2017. Under the theme, “Increasing Impact through Transparency, Accountability, and Partnerships”. Since the epidemic was first confirmed in Uganda more than 36 years ago, tremendous medical progress has been witnessed. This has enabled the global community to register significant successes in the fight against one of the deadliest and perhaps the longest pandemic that has ever besieged human kind. Public health practitioners now believe that the available tested tools and strategies if used optimally, can help the world to attain an HIV free generation by 2030 based on United Nations Sustainable Development Goals. 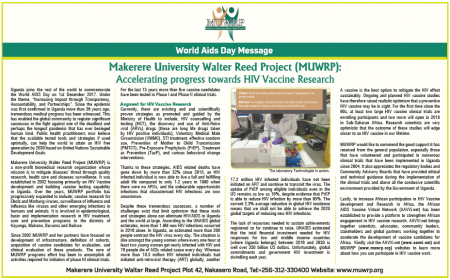 Makerere University Walter Reed Project (MUWRP) is a non-profit biomedical research organization whose mission is to mitigate diseases’ threat through quality research, health care and diseases surveillance. It was established in 2002 focusing primarily on HIV Vaccine development and building vaccine testing capability in Uganda. Over the years, MUWRP portfolio has progressively expanded to include; vaccine research for Ebola and Marburg viruses, surveillance of influenza and influenza like viruses and other emerging infections in humans and animals. It is involved in epidemiological, basic and implementation research in HIV treatment, care and prevention programs in the districts of Kayunga, Mukono, Buvuma and Buikwe. Since 2002 MUWRP and her partners have focused on development of infrastructure, definition of cohorts, acquisition of vaccine candidates for evaluation, and clinical evaluation of these products. The core of MUWRP programs effort has been to accomplish all activities required for initiation of phase III clinical trials. For the last 15 years more than fi ve vaccine candidates have been tested in Phase I and Phase II clinical trials. 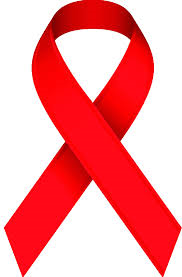 Currently, there are existing and scientifically proven strategies as promoted and guided by the Ministry of Health to include; HIV counselling and testing (HCT), the discovery and use of Anti-Retro viral (ARVs) drugs (these are long life drugs taken by HIV positive individuals), Voluntary Medical Male Circumcision (VMMC), STI treatment, effective condom use, Prevention of Mother to Child Transmission (PMTCT), Pre-Exposure Prophylaxis (PrEP), Treatment as Prevention (TasP), and various behavioral change interventions. Thanks to these strategies, AIDS related deaths have gone down by more than 32% since 2010, an HIV infected individual is now able to live a full and fulfilling adult life compared to only 1-2 years in 1980 when there were no ARVs, and the unbearable opportunistic infections that characterized HIV infections are now uncommon. Despite these tremendous successes, a number of challenges exist that limit optimism that these tools and strategies alone can eliminate HIV/AIDS in Uganda and the world at large. According to the UNAIDS global estimates, more than 1.8M new HIV infections occurred in 2016 alone. In Uganda, an estimated more than 200 people contract the HIV virus every day. The situation is dire amongst the young women where every one hour at least two young women get newly infected with HIV and 76 people die of AIDs related cause every day. Whereas more than 19.5 million HIV infected individuals had initiated anti-retroviral therapy (ART) globally, another 17.2 million HIV infected individuals have not been initiated on ART and continue to transmit the virus. The uptake of PrEP among eligible individuals even in the US remains as low as 10%, despite evidence that PrEP is able to reduce HIV infection by more than 95%. The current 2.3% average reduction in global HIV incidence means that we shall not be able to achieve the 2020 global targets of reducing new HIV infections. The lack of resources needed to sustain achievements registered so far continue to raise. UNAIDS estimated that the total financial investment needed for HIV responses for low and middle income countries (where Uganda belongs) between 2016 and 2030 is well over 350 billion US dollars. Unfortunately, global commitments and government HIV investment is dwindling each year. A vaccine is the best option to mitigate the HIV effect sustainably. Ongoing and planned HIV vaccine studies have therefore raised realistic optimism that a preventive HIV vaccine may be in sight. For the first time since the 90s, at least two large HIV vaccine clinical trials are enrolling participants and two more will open in 2018 in Sub-Saharan Africa. Research scientists are very optimistic that the outcome of these studies will edge closer to an HIV vaccine in our lifetime. MUWRP would like to commend the good support it has received from the general population, especially those that have volunteered and participated in numerous clinical trials that have been implemented in Uganda since 2004. It also appreciates the regulatory bodies and Community Advisory Boards that have provided ethical and technical guidance during the implementation of the clinical trials and above all the conducive scientific environment provided by the Government of Uganda. Lastly, to increase African participation in HIV Vaccine development and Research in Africa, the African AIDS Vaccine Virtual Network (AAVVi.net) has been established to provide a platform to strengthen African engagement in HIV vaccine research. AAVVi.net brings together scientists, advocates, community leaders, stakeholders and global partners working together to accelerate the development of vaccine candidates for Africa. Kindly visit the AAVVi.net (www.aavvi.net) and MUWRP (www.muwrp.org) websites to learn more about how you can participate in HIV vaccine work.